If you’re reading this, then you may be having trouble sleeping too. I’m sorry. I know how exhausted you feel right now. I’m on this journey to find a good night’s sleep right along with you. As I said in the post, “Introduction,” I struggled with sleep issues. I tried everything, but nothing helped long term. I was only getting about three or four hours of sleep a night. I blamed it my job, the chronic pain, headaches, lousy diet, little exercise; you name it. 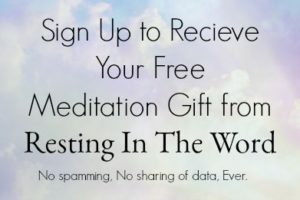 I know I’m not alone, and that’s why I started this website with a guided meditation in scripture that blesses your spirit as it blesses your sleep. A few years ago there was an energetic little 6-year-old girl at the school where I taught. When she became feverish and tired, here parents thought she just had a bad case of the flu. But as her symptoms were worsening, even after weeks of doctor visits, the doctor ran more specific tests. It was only after that that the parents found out the sweet child with the big smile was suffering from a form of childhood cancer. That truth was devastating for the parents to hear. Of course, even if that truth is something the patient doesn’t want to hear, it’s a truth that doctors must find before being able to cure or relieve the condition. And that adorable little six-year-old? She is now a healthy, cancer-free, teenager. Sometimes the truth that’s hardest to hear can be that which saves us. I’m on this journey to find a good night’s sleep right along with you. As I said in episode 1, “Introduction,” I struggle with sleep issues. I’ve tried everything, but nothing helped long term. I’ve been grappling with this problem for over four years. Back then, I was much sicker than I thought and was only getting about three or four hours of sleep a night. I blamed it on stress, chronic pain, and headaches, lousy diet, little exercise; you name it. Now even though the stress, headaches, and health were somewhat improved after I retired from teaching, I was still struggling to get a good night’s sleep. I tried listening to audiobooks, music, anything to take my mind off trying to sleep. Nothing helped. Where was the peace I was looking for? What I needed to hear was scripture. Something that blessed my spirit as I drifted into sleep. And that’s what this new podcast is about, blessing your spirit as it blesses your sleep. Here at Resting in the Word, I’ll always have complete information on each verse right here on my website. This is also the place where you can email me if you want to get in touch. Please feel free to listen to the short podcast by clicking on the “play” button above. And get ready to be blessed with the soothing words of scripture set to soft, meditation music. In this crazy world, we can all use a few more blessings in our lives, so I pray the following restful moments will bless you as much as they have me! SCRIPTURE AS READ ON PODCAST, Listed in order: Jeremiah 29:11-12 New International Version (NIV); Jeremiah 29:13 King James Version (KJV); Proverbs 30:5 English Standard Version (ESV); Proverbs 30:5 ESV; Psalm 25:4-5 NIV; Psalm 26:1-3 KJV; Ps. 33:2-5 KJV; Ps. 40:11 KJV; Ps. 57:1-3 KJV; Ps. 86:10-12 KJV; Ps. 100 KJV; Numbers 6:24-27 KJV.